Nasty, mean, killing things lurk everywhere in the jungles of South America. There are blackflies, for example, that can give you onchocerciasis – river blindness – caused by worms that get in your eyeballs; sandflies that transmit a leprosy-like disease called leishmaniasis; assassin bugs whose load of protozoa can kill you with a heart/brain malady known as Chagas’ disease; and mosquitoes that carry dreaded illnesses such as malaria and yellow fever. Large animals deal death in many ways as well. Twenty-foot anacondas squeeze the life from you, vipers such as the fer-de-lance and bushmaster inject deadly venom through inch-long fangs, electric eels deliver 600 volts of killing power, jaguars administer the coup-de-grace with a bite to the head, and catfish the size of great white sharks could simply swallow you whole if they desired. Anglers visiting South America worry little about these creatures, however. Instead, they worry about little fish called piranhas. If you can believe U.S. President Theodore Roosevelt, there is good reason to worry. In his 1914 book, Through the Brazilian Wilderness, Roosevelt first gave widespread publicity to the notion that piranhas are man-eaters. While fishing on Venezuela’s Rio Paragua, I met many guides who exhibited the classic circular scars of piranha bites, but most admitted the bites occurred while handling piranhas. It was not unusual for these men to dive into the water to retrieve a snagged lure. They bathed in the same waters where we caught piranhas on hook and line. They had no fear of the fish some called “caribe capa-burro” – the cannibal that castrates donkeys. One day, however, I witnessed an incident that exemplifies what can happen to careless anglers. We were using small live piranhas as bait for payara. We caught them on hooks baited with bloody beef, then dropped them in a livewell. Our guide, Jesus Perez, thought it funny to reach into the livewell and shriek as if he had been attacked each time he prepared to bait our hooks. Once, after a particularly blood-curdling yell, Jesus withdrew his hand from the bait tank, and we gazed, horrified, at a piranha that had engulfed his finger. The piranha was dead, however. It was a joke. We ignored Jesus’ antics after that, but once while he was trying to corral an elusive piranha in the bait tank, he yanked his hand away and winced. I looked at him as if to say, “I’m not falling for it, Jesus.” Then I noticed blood on his right index finger. The piranha’s razor-blade teeth had removed his fingertip, including part of the fingernail. Jesus had been bitten by piranhas on other occasions. On each forearm were scars from wounds he received while bathing in the Orinoco River as a boy. He did not fear the piranhas, he told us. They do not normally attack humans as is often believed. However, he continued, if one swims with piranhas his entire life, sooner or later he is bound to get nipped. And if a man is foolish enough to enter the water with a fresh wound on his body, the piranhas might leave nothing more than a skeleton. 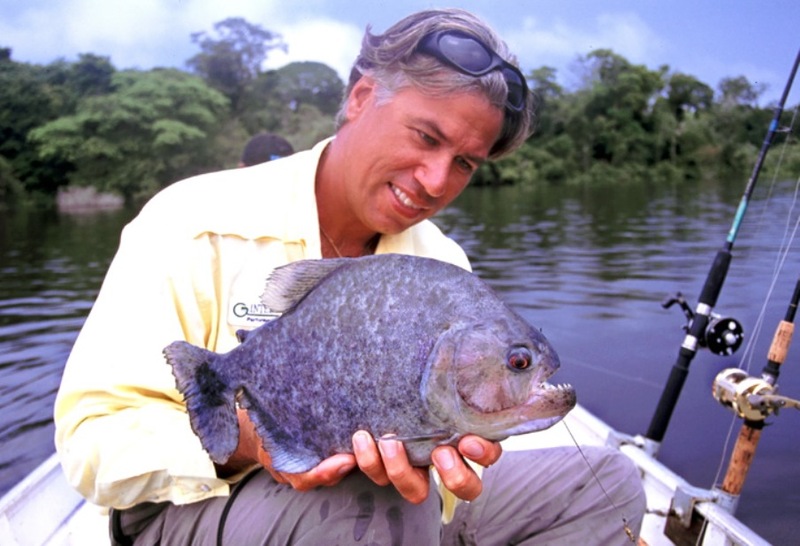 In the Brazilian and Venezuelan waters I have fished, piranhas were amazingly abundant. They would immediately devour any fresh meat dropped into the water. I caught several species using beef or fish flesh for bait. And many, including some truly large specimens, were taken on Rat-L-Traps or the gigantic topwater lures we used to entice peacock bass. All were tough fighters, battling like bluegills on steroids. The most fearsome specimen I examined was a black piranha. When I cast a big prop bait near the bank, this 5-pounder struck with unbridled fury, sending water high into the air. At first, I thought it was a peacock bass, a species known for its amazingly vicious strikes. The piranha fought hard, requiring several minutes to land. Seventeen species of piranhas live in South America’s rivers, lakes and lagoons, from the eastern slopes of the Andes through Colombia, Venezuela and the Guianas, south and eastward across the immense Amazon Basin, and into Bolivia, parts of Peru, Paraguay, Uruguay and northeastern Argentina. Their common name comes from the Tupi Indian dialect, in which “pira” means fish and “ranha” means tooth. The presence of blood generally is believed to stimulate the feeding frenzy of flesh-eating piranhas. However, evidence indicates sound may play a larger role in triggering attacks. Piranhas have highly developed auditory organs; sounds of splashing created by panicked victims draw them like iron filings to a magnet. Often, when we targeted piranhas, our guides would thrash the water with a fishing rod to bring them near. And more than once, I saw peacock bass attacked by piranhas while in the midst of wild struggles against a fishing rod. Sometimes only minor wounds were evident when the peacock was landed. But sometimes we reeled in nothing but a head. No doubt, many hapless animals struggling in the water are attacked and killed by piranhas, including, occasionally, humans. One night in Manaus, Brazil, I enjoyed a sumptuous meal in one of the city’s finest restaurants. For the first course, I was presented a bowl of thin broth flavored with tiny chunks of fish. “What type of soup is this?” I inquired.